TORONTO (December 20, 2013) – Pavel Kubina, a Stanley Cup champion, All-Star, and three-time Olympian announced his retirement today from the National Hockey League (NHL) after 13 seasons. Kubina played 970 career NHL games, scoring 110 goals and 276 assists, while recording totals of 386 points and 1,123 penalty minutes. He also played in 51 playoff games, 22 of which came in 2004 when the Tampa Bay Lightning won the Stanley Cup. Kubina’s career started in Tampa Bay in 1998 where he played for nine years until he signed as a free-agent with the Toronto Maple Leafs in 2006. He was traded to the Atlanta Thrashers in 2009, before he returned to Tampa Bay as a free-agent in 2010. Kubina ultimately finished his career with the 2011-12 season split between the Lightning and the Philadelphia Flyers. Internationally, Kubina represented the Czech Republic in every major hockey championship: he played for his country three times in the Olympics (2002, 2006, 2010), highlighted by a bronze medal finish in 2006; he was a member of three gold medal-winning teams in four trips to the World Championship (1999, 2001, 2002, 2005); he played once in the World Cup of Hockey (2004); and he also played in the World Junior Championships (1995). He was drafted by the Lightning in the seventh round, 179th overall in the 1996 NHL Entry Draft. Before he reached the NHL, Kubina played for Vitkovice in the Czech Republic and Moose Jaw in the Western Hockey League. After he started the 1997-98 season with Adirondack in the American Hockey League, Kubina made his NHL debut on March 14, 1998 when he recorded his first career NHL point – an assist – with the Lightning. He played 10 games with the Lightning that season, which included scoring his first career NHL goal on April 13, 1998. In 1998-99, Kubina led all NHL rookies in average ice-time (22:47), scored nine goals, 21 points, and played in 68 games. He led all Lightning defencemen in goals (8), points (26), penalty minutes (93) and shots (128) in the 1999-00 season. In 2000-01, Kubina averaged his highest career ice-time (24:06), played in 70 games and scored 11 goals and 30 points while he also scored a career-high five points in a game on November 22, 2000. In 2001-02, he played in all 82 games and led the team in average ice-time (23:39) and blocked shots (129) while he also led Lightning defencemen in scoring with 11 goals, 23 assists and 34 points. He played 75 games in 2002-03 and recorded 22 points while helping lead the Lightning to the playoffs. The 2003-04 season was a memorable one for Kubina. In the regular season, he played 81 games, scored a career-high 17 goals – including eight on the power-play and four game-winning goals – and recorded 35 points, a plus-minus of +9, 85 penalty minutes and averaged 21:09 in ice-time while helping lead the Lightning to a first-place finish in the Eastern Conference. In the 2004 playoffs, Kubina played 22 games, recorded four points and averaged 22:54 of ice-time while helping the Lightning win the franchise’s first and only Stanley Cup. Following the 2004-05 lockout, which he spent part of with Vitkovice in the Czech Republic, Kubina recorded a career high in assists (33) and played 76 games in 2005-06 for the Lightning as he helped the team again reach the playoffs. On July 1, 2006, Kubina signed with the Maple Leafs as an unrestricted free-agent. He set career marks in points (40) and matched his best in game-winning goals (4) in each of the 2007-08 and 2008-09 seasons in Toronto. He led all Leafs defencemen in goals (14) in 2007-08, while he also accomplished a unique feat by scoring the game-winning goals on back-to-back days (March 11 & 12, 2008). In 2008-09, Kubina scored a career-high nine power-play goals – tops among all Leafs defencemen – and played in all 82 games. Over the three seasons he played for the Maple Leafs, he averaged totals of nearly 34 points and over 22 minutes played to go along with close to 11 goals and 23 assists in nearly 72 games each season. “Pavel was one of the best defencemen I played with during my NHL career. More importantly he was a great teammate and friend. I will always care about Pavel as one of my best friends,” said Mats Sundin, NHL veteran of 18 seasons. Kubina was traded to the Thrashers in July of 2009. In 2010-11, his only season in Atlanta, he played 76 games and recorded 32 assists, 38 points and averaged 22:38 in ice-time. He returned to Tampa Bay by signing as a free-agent in July of 2010. In 2010-11, Kubina played 79 games, scored 23 points and averaged 19:14 in ice-time while he also helped the team reach the second round of the playoffs. 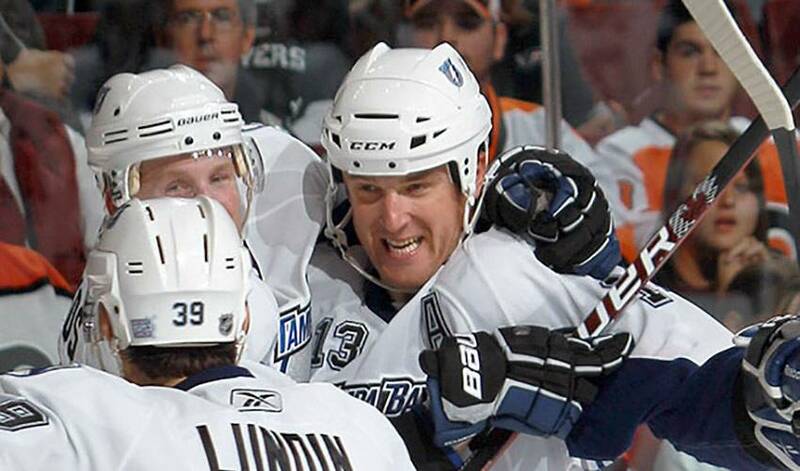 After playing 52 games with the Lightning in 2011-12, he was traded to the Philadelphia Flyers. He finished 2011-12 – his final season in the NHL – by playing 17 regular season games for the Flyers and also saw action in four playoff games. In his retirement, Pavel resides in St. Petersburg, Florida with his wife Andrea and their two girls, Tereza and Victoria.